Despite my still unclear feelings on the original end of the Wolves of Mercy Falls series, Forever, one thing was always clear: Cole and Isabel’s story never felt finished. Well, now Cole and Isabel are in the spotlight in more ways than one. Cole thought he left all his demons behind when he left the music spotlight roughly three years ago. Now he’s back in L.A., but entering the fame game and making music again isn’t the main thing on his agenda. No, that would be Isabel. Finding the prickly girl who sparks all kinds of feelings in Cole won’t be difficult, but keeping her may prove to be more challenging than he thought. It may just cause him to question whether he’s really changed or if he’s headed down the same road of destruction that lead him here. Isabel Culpeper is dealing with enough in her life. The last thing she needs, or so she tells herself, is the reemergence of Cole St. Clair. After the tragic death of her brother, Isabel’s parents separated and Isabel moved to L.A. with her mother. She’s enrolled in school that will ultimately help her towards her pre-med goal, and she works at a posh clothing boutique. She comes across as seemingly uncaring and it sits just fine with her if people find her cold-hearted. Enter Cole. He actually makes her feel. After seeing what ‘love’ has done to her parents, Isabel vows to not fall under its spell. Sinner was pretty straight forward in its execution. Cole has to overcome those who are predisposed to think of him as a lost cause. The whole book I was rooting for Cole not to give up, but you can see that he balances precariously on the edge. We saw in Linger and Forever that there’s more to Cole than his past and I would smile every time he proved it here, especially when delivered with his usual style of arrogance. Isabel’s troubles are a little less straight forward. I found it was more difficult sorting through her thought processes, but it’s very clear that her parents’ situation deeply affects her. You see moments where she regrets her words/tone of voice, which only shows her true character; that she doesn’t want to be a mean and uncaring person. This only further makes me able to forgive (most of) the way she acts. 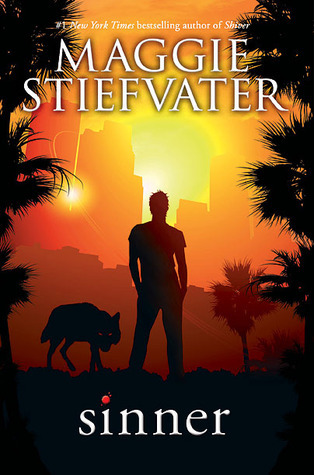 Maggie Stiefvater has already spent three books exploring wolf mythology (as it stands in her fictional world). Perhaps surprisingly (or not), Sinner is more focused on Cole integrating himself back into the public eye and Isabel trying to cope with her changing family situation. Somehow the ‘wolf’ aspect gets weaved into Cole’s addictions. He uses the wolf as a means to escape from the world, to forget himself for a while. There’s still a part of him that wishes he could give himself over to the wolf completely thereby truly disappearing. One draw of Sinner is watching whether Cole and Isabel will choose to fight for life, or just decide to disappear, whether that disappearance is physical or emotional. While Sinner could be read as a standalone, it is clear that it was written for the fans. Stiefvater even dedicates this to “the readers.” I love that she decided to revisit these characters. I feel like I can finally call the Wolves of Mercy Falls case closed.